Peach Rhubarb Pie Preserve - Just enough time before work! - Canning Homemade! 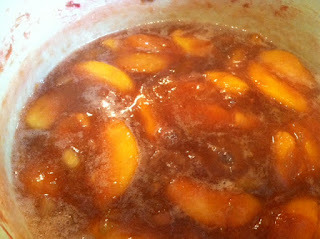 Home » Peaches » Rhubarb » Peach Rhubarb Pie Preserve - Just enough time before work! Peach Rhubarb Pie Preserve - Just enough time before work! I woke up this morning after last nights three hour one-on-one canning with a food writer from 805 Living magazine thinking about whether I said everything. I loved that since she had never canned before that this was a somewhat "different" experience for her, but her "respect" for the ingredients made the process like watching a silent cooking show. Me giving the direction while she glided across the kitchen floor like she had done it all her life. After the canning was done and the jars were out of the water bath, she commented on how easy it was, how thankful she was that I was there for her first time, and how quickly the process was to get the canning done. Her jars, which hopefully will get photographed, were close to perfect. The color was vibrant and she commented on how clear the liquid was in the jars and surprised that they were so beautiful. It was a good "end note" since I find some of the jars that I can are just "art" regardless of how great they taste. But the reason for the post was a my head swirling for the hour drive home as to what was in the house that I still needed to get in jars. Because I get produce now from friends gardens and now my garden seems to produce more each day, I find myself thinking about what's left to work on so that it doesn't spoil or get beyond the ability to freeze it for later. That reminded me that I have these gorgeous peaches from Saturday's canning that didn't get done and they would be perfect to make a great preserve. I also remembered the Rhubarb that I got at the garden exchange on Sunday. When I woke up, I looked at the clock this morning and it was 6:45am. I have one hour before I have to wake my son, put in a load of laundry and put a load away, and get ready for work. Could it be possible that I could put up a batch of Peach Rhubarb Pie Jam before I leave for work and still have time to do the dishes? The answer was that I was going to cut it close but I was going to give it a try. Here is the recipe. The results are that when you set your mind to something, anything is possible! Was at work on time too! (You can do this recipe in regular speed as well. You can pre-sterilize your jars, have your lids in pot of hot water, and take your time moving about the kitchen.) When I woke up my son he asked if I was making Apple Pies? Love him! Love the chunks of peaches! 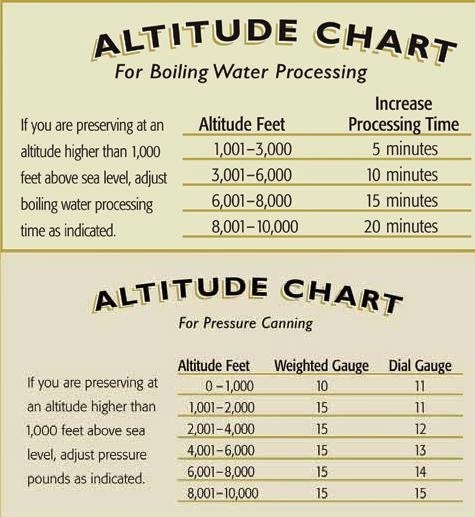 Fill you small batch canner (or full size) with water and get it on high heat. Cover with lid to get the water up to temperature faster. If you have hard water add 2 T. white vinegar to avoid the hard water "cloudiness" on the jars. Add to a stainless steel saucepan the Rhubarb, peaches, and lemon juice and cook on medium heat for 15 minutes, stirring occasionally. Peaches before I broke them up! the counter. Turn off the flame under the recipe when the minute is up. Put the lids to the jars into the water bath canner to heat the sealant. Move the pot to where the jars are located on the towel and ladle the recipe into the jars filling to 1/4" headspace. Using a rubber spatula remove air bubbles and refill if needed. Using a wet paper towel or cloth, clean the rims of the jars. Using your magic wand (lid lifter) put the now hot lids on the jars and add the rings, tightening finger tight. Put the jars into the canner and process for 10 minutes at a full boil. Do the dishes from the recipe and clean counters. Put away clothes and wake up the kid as you go get ready for work. Once the timer goes off wait a few minutes, remove the jars from the water bath and off to work with 5 jars of preserves ready to admire when you get home!